The best Guacamole recipe is one that is simple and loaded with fresh ingredients! Creamy ripe avocado mashed with zesty lime, cilantro, onion and a pinch of salt. 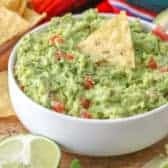 The perfect dipper for The BEST Loaded Nachos, this guacamole dip takes just minutes to prep making it the perfect snack. When I visit Mexico, I live and breathe guac (and Pico de Gallo). 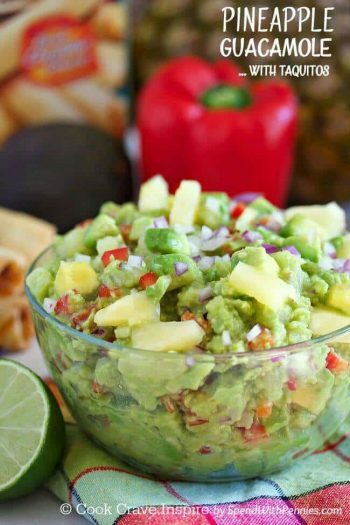 Ingredients found in an authentic guacamole recipe are fresh avocados, lime juice, salt & usually onion/cilantro. In Mexico we always have a bit of tomato in our guacamole as well. 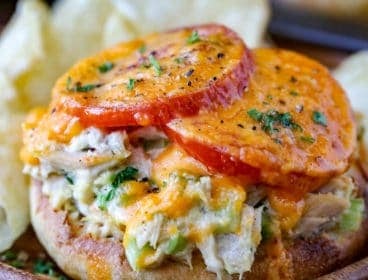 The great thing about about this dip is that you can vary the ingredients however you want! Add extra garlic, spice it up, add roasted peppers or corn. DICE: Finely dice some red onion and mince the jalapeno pepper (remove seeds for less heat, leave seeds/membrane for more heat). SEED: Seed and chop the tomato. Removing the seeds and pulp and just use the flesh, this will prevent the guacamole from being too watery. PEEL: Peel and mash the avocados with the lime juice until smooth. The lime juice keeps the guacamole from turning brown. 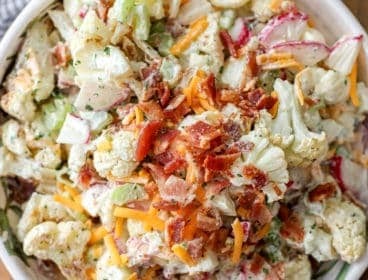 MIX: Mix all the ingredients together, season to taste and enjoy! Guacamole is a dish that really should to be served fresh to be appreciated. Just like apples and raw potatoes, avocados start to turn brown pretty fast after cutting, due to an enzyme that promotes oxidation. 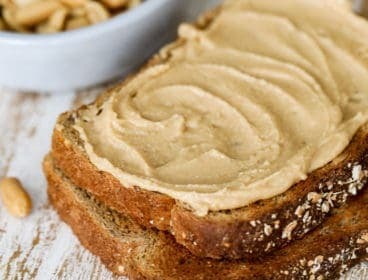 This discoloration doesn’t mean it’s spoiled, but it can be unappetizing! The lime juice in this easy guacamole recipe helps slow that process. 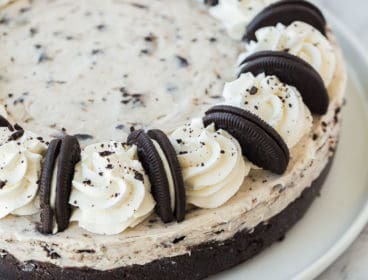 It will keep in the refrigerator 1-2 days. If the surface does turn brown, after no more than a couple days, you can try scraping it off. The green layer underneath is perfectly fine. 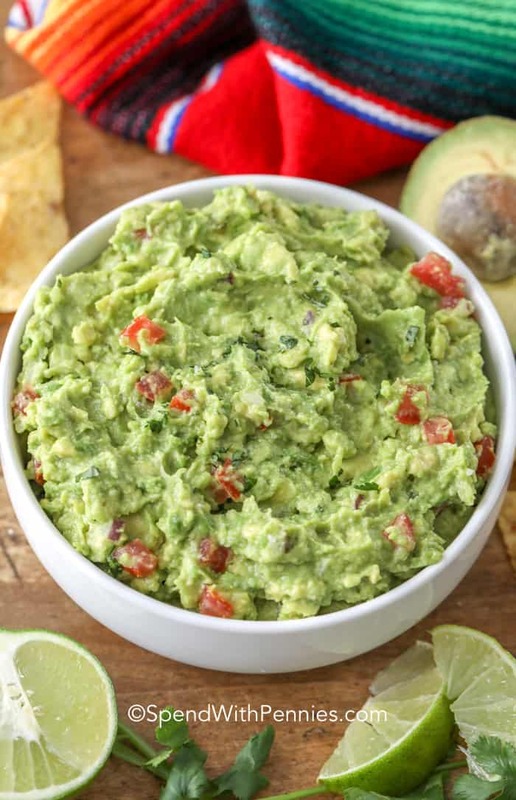 The secret to keeping your “guac” green and fresh-looking in the refrigerator is to prevent air from hitting the surface. Plastic containers – even ones’ with tight seals – are not sufficient. I like to press a piece of clingy plastic wrap over the surface and up the sides of the bowl to create an airtight seal. Can you freeze guacamole? Yes, you can (who knew?) but I do have to admit, it tastes best fresh. 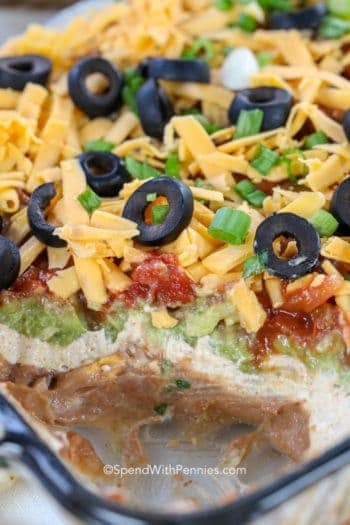 Freezing the guacamole can change the flavor/consistency a little bit but it’s great for recipes like 7 Layer Dip. 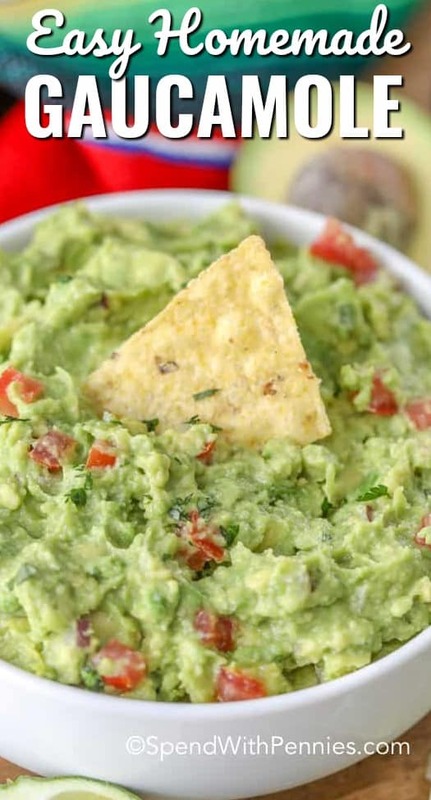 If you’re freezing guac, skip the onion tomato etc. The veggies will get watery. 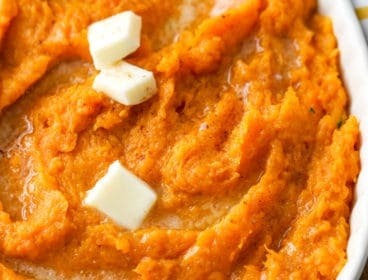 Scoop it into freezer bags and squeeze out all the air to create a tight seal. When you are ready to make my simple guacamole recipe, just thaw and mix in the rest of the fresh ingredients. Adjust the seasoning and enjoy! 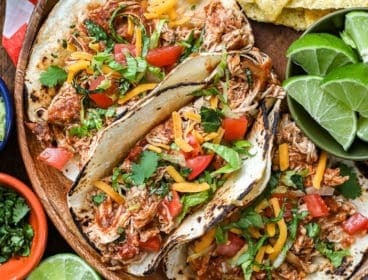 Creamy Chicken Enchiladas – My favorite!! Taco Soup – So quick and easy! 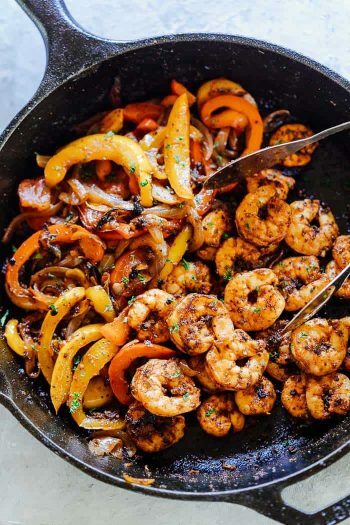 Shrimp Tacos – Quick and easy. 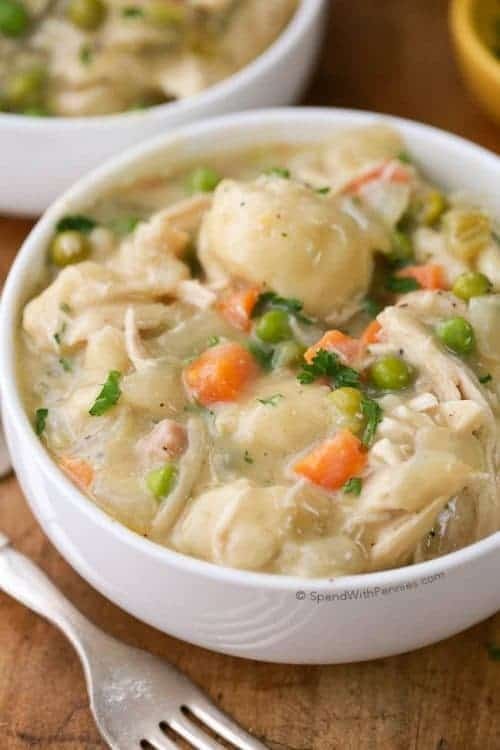 White Chicken Chili – Creamy family favorite. Guacamole is one of my favorite things ever. 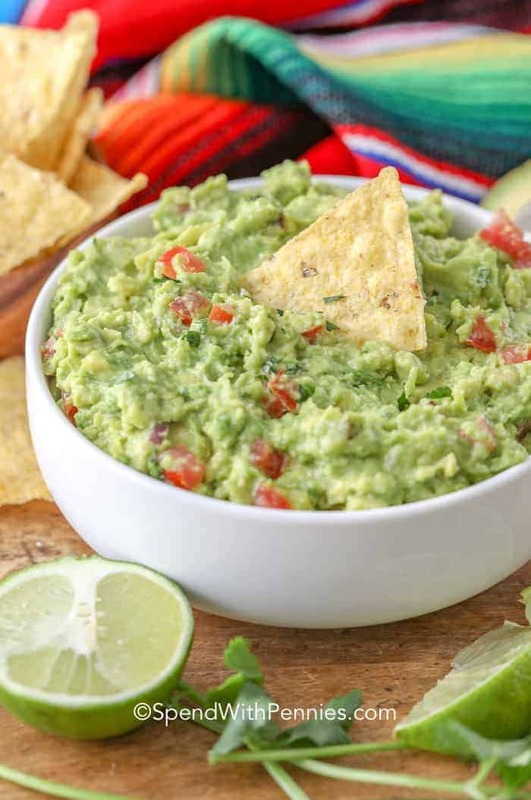 If you need a quick contribution for a party or potluck, you can always rely on guacamole dip to be well received! Cut avocados in half, peel and remove the pit. Squeeze half of the lime over the avocados and mash until smooth. Add remaining ingredients and mix well adding salt to taste and more lime juice if desired. 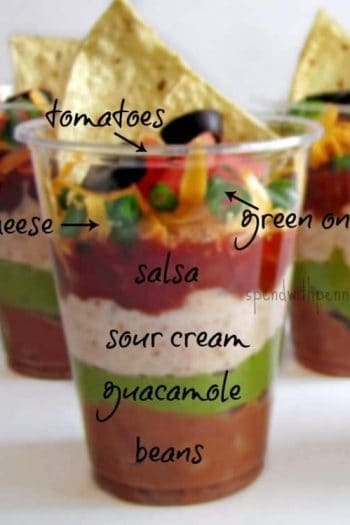 Individual 7 Layer Dip Cups Recipe! 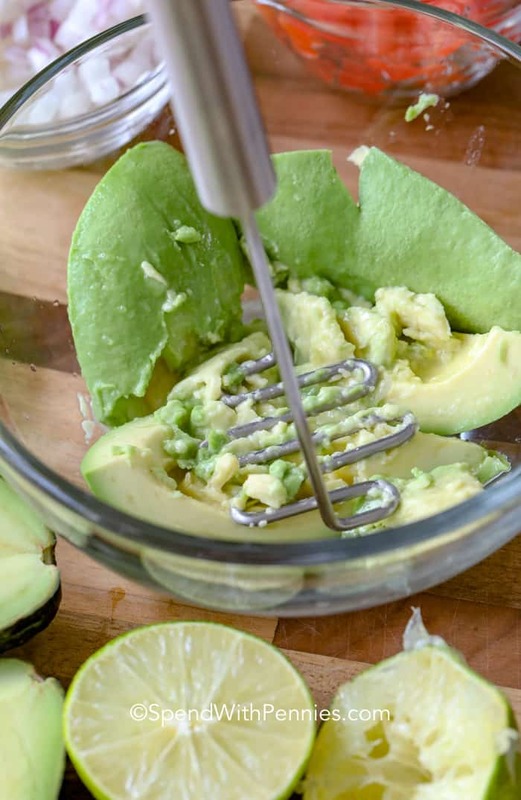 If you place the avocado seed in the leftover quac it will stop the browning process. The leftovers still need to be covered and refrigerated. I’ve never tried this Candy but I definitely will! Thanks for the tip! I love this idea!! Going to try on my next batch. The greenish sauce in Indian and Pakistani traditions is known as CHATNI. Good read I must say. I had no idea Gabriella, thank you for sharing!